At Kremo Ice Cream, we aren't just making hand-rolled gourmet ice cream. We are taking it to new heights using natural and locally sourced cream, making every roll extra creamy and delicious. Our fresh, sweet cream is pasteurized daily in our kitchen. All of our ice cream rolls are made-to-order. Using real fruit flavors and gourmet ingredients, combined with the hand-rolling techniques, it truly makes Kremo ice cream a delicious and special experience. 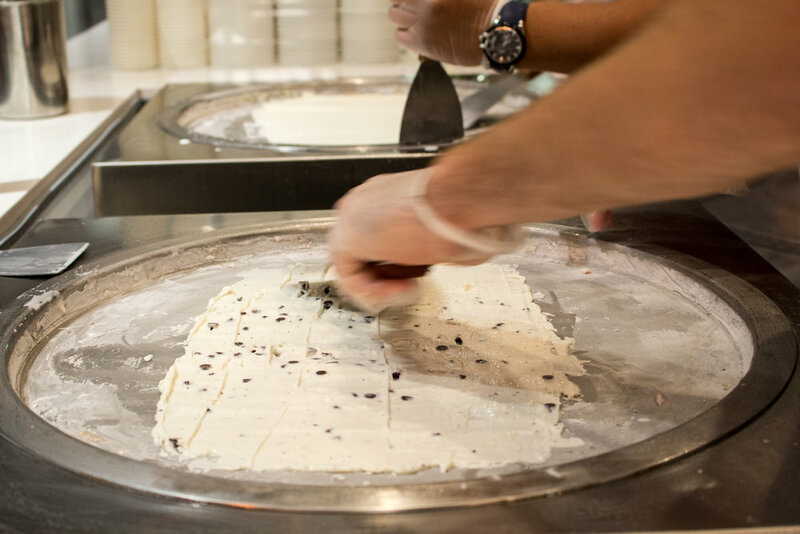 Every ice cream is chopped by hand, and carefully crafted into delicious frozen treats. 1. Chopping: Fresh cream is poured on to the freezing pan with selected ingredients. As the cream freezes, it is chopped and churned into a delicious mixture. 2. Spreading: Before the ice cream mix is solidified, it is spread briskly and evenly across the freezing pan. 3. Rolling: At an optimal freezing point, the frozen cream mix is carefully pushed and rolled into gourmet ice cream rolls.